This is Part II of a two part series. We strongly recommend reading Part I before reading another sentence of this post. A modern depiction of Huo Qubing's cavalry charging a surprised Xiongnu force. Edward Luttwak is wrong. The Han did not corrupt, bribe, or culturally weaken the Xiongnu Empire into submission. If the “peace marriage” (heqin) system Luttwak describes did not do the Xiongnu in, what did? To answer that question it is best to step back for a moment and reflect on why the Xiongnu were such an intractable strategic dilemma for the Han in the first place. By the Han's own estimate the population of the Xiongnu Empire was only one twentieth of China's. They were undisciplined, technologically backward, and poor. They had no professional military, little in way of bureaucracy, and nothing save foggy oral history to inspire or guide them. Their success rested on one key advantage: mobility. When we moderns think of the advantages mobile horse archers have over infantry armies our minds jump to the tactical—Parthian archers wheeling about at Carrhae, Mongol faux-retreats, and their like. However, for most of Inner Asian history nomadic mobility had its greatest impact at the strategic level of warfare. The nomads had no population centers to defend. They had no walls to guard and did not have to worry about holding key strategic points. When an enemy force threatened their homes they could simply pack these homes up and move them somewhere else until the danger was over. If an enemy army could not be beat in a pitched battle then the nomads would not fight a pitched battle. They would retreat, disappearing into the desert or grasslands until the enemy was forced to return home. These retreats and migrations took a toll on the nomads' herds, but it did not bring them to economic ruin. The same was never true for the Chinese. The economic costs of any expedition against a nomadic foe were enormous. To call a soldier on a campaign was to take him away a farm; the state not only had to pay him for his service but had to do so with a smaller tax base. The state also had to feed him while on the campaign. The bigger the force the more supplies needed to feed it. The steppe is hostile to invading armies; there are few farms to plunder or cities to loot. Everything the army will eat on the campaign must be brought with it. This means long supply trains. The further the Chinese chased the nomads into the steppe the longer and less protected these supply trains would become. Eventually the invading force would reach a point where their supply lines could be stretched no farther. If at this point they decide to turn around and return home then they have wasted their entire treasury and gained nothing from it. On the other hand, if they try to hold their position the nomads will circle round, cut the supply lines, and leave the invading force to starve in the desert. The Chinese are offered a grim choice between retreat and death. Worst of all, once the invaders have returned home and disbanded (or if they chose death and were all slaughtered in the desert) there is nothing to stop the nomads from returning to the border and continuing on with the standard raids, surprise attacks, and pillaging nomadic warriors are famous for . For two millennia this was the default pattern for Sino-nomadic warfare. Not all of these conflicts followed the pattern; occasionally innovators like Chingis Khan would arise, finding ways to transform retreating nomads into an aggressive, civilization-toppling, military machine. From the Chinese side there would also be the occasional innovator who understood what it took to wage war on the steppe. For the Han, this man's name was Wei Qing. “The Han strategists plotted together, saying, “Zhao Xin, the marquis of Xi, who is acting as adviser to the Shanyu is convinced that, since the Xiongnu are living North of the desert, the Han forces can never reach them.” They therefore agreed to fatten the horses on grain and send out a force of 100,000 cavalry, along with 140,000 horses to carry baggage and other equipment (this in addition to the horses provided for transporting provisions). They ordered the force to split up into two groups commanded by the general in chief Wei Qing and the general of swift cavalry Huo Qubing. The former was to ride out of Dingxiang and the latter out of Dai; it was agreed that the entire force would cross the desert and attack the Xiongnu. ….Wei Qing’s army, having traveled 1,000 li [aprox 310 miles; 644 km] beyond the border, emerged from the desert just at the point where the Shanyu was waiting. Spying the Shanyu’s forces, Wei Qing likewise pitched camp and waited. He ordered the armored wagons to be ranged in a circle about the camp and at the same time sent out 5,000 cavalry to attack the Xiongnu. The Xiongnu dispatched some 10,000 of their own cavalry to meet the attack. Just as the sun was setting, a great wind arose, whirling dust into the faces of them until the two armies could no longer see each other. The Chinese then dispatched more men to swoop out to the left and the right and surround the Shanyu. When the Shanyu perceived how numerous the Han soldiers were and perceived that the men and horses were still in strong fighting condition, he realized that he could win no advantage in battle…. And accompanied by several hundred of his finest horsemen, broke through the Han encirclement and fled to the northwest…. All in all Wei Qing killed or captured 10,00 of the enemy, He then proceeded to Zhao Xin’s fort at Mt. Tianyan, where he seized the Xiongnu’s supplies of grain and feasted his men. He and his army remained there only a day, however, and then setting fire to the remaining grain, began the journey home. This passage has within it everything you need to know to understand the strategy the Han used to defeat the Xiongnu. If you skimmed through it go read it again. You will have trouble finding any of Luttwak's "addiction" or "indoctrination" here. There are a few things worth noting about the kind of military operation recorded in this account. The demands of the war forced the Han to restructure not only the Chinese state, but all of Chinese society. The Han’s willingness to radically restructure their society to meet the immense financial and logistic demands of an eighty year conflict is one of the central reasons they emerged victorious from it. Huo Qubing, Wei Qing and the other generals on the frontier were able to negate the nomad's central advantage by changing the nature of the Han armies they commanded. Frontier armies were no longer free holding peasant draftees from the interior, but professional soldiers permanently stationed on the frontier. This is important, because it gave them the time to master the equestrian techniques a column of flying cavalry required. By the end of the war the Han cavalry were just as good at lancing and shooting from horseback as the nomads themselves (the recruits often were nomads). Tactically they were the Xiongnu’s superiors. The switch to a cavalry dominated force opened up new options to the Han army. Now it was possible to move just as fast as the nomads—if a Han force set out in surprise then they could usually arrive in the midst of the Xiongnu before the nomads knew what was coming. At best the Xiongnu were given a small space of time to prepare a response, and at worst the Han would arrive in the middle of the night and slaughter the Xiongnu in their sleep. Slaughter is the proper word to use here. The only way to dismantle a nomadic empire is to play the steppe warfare game as well as they do. That meant changing both the strategic aims and tactical principles Chinese armies usually relied on in extended campaigns. Sunzi’s judgment that “one who excels in employing the military subjugates other people’s armies without engaging in battle, captures people’s fortified cities without attacking them, and destroys other people’s states without prolonged fighting. 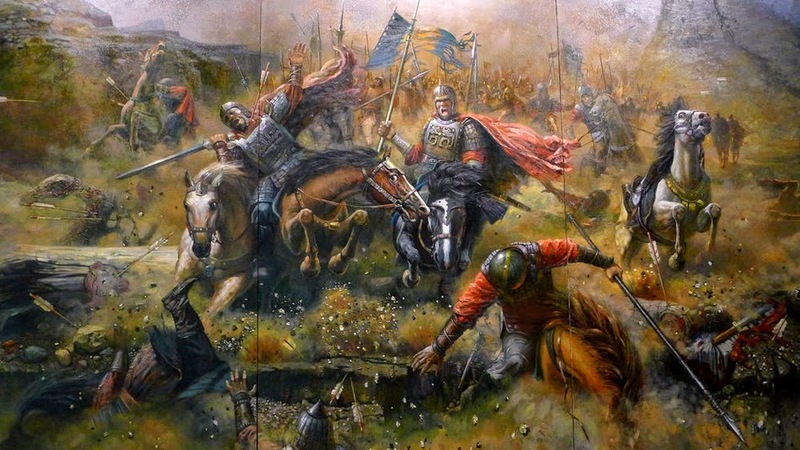 He must fight under Heaven with the paramount aim of ‘preservation’”  was sensible in the context it was written—a world of agrarian warfare in an interstate system of two dozen petty kingdoms that lacked the means to sustain extended operations—but it was suicidal on the steppe. “Preservation” cannot be the paramount aim of an army operating on the steppe. A nomad that gets away is a nomad that will fight you on a later day. Conversely, nomadic peoples had very little in terms of lands, cities, or possessions worth plundering or ‘preserving’. A nomadic empire’s greatest wealth was its people. Warfare between nomadic confederations were ultimately wars over people, where one side would do everything in its power to slaughter as much of the enemy as they could and capture, forcibly resettle, and incorporate into their own military anybody left over. The Han followed the same basic strategy. The aim of generals like Wei Qing and Huo Qubing was to kill every single man, woman and child they came across and by doing so instill such terror in their enemies that tribes would surrender en masse upon their arrival. By trapping the Xiongnu into one bloody slug match after another the Han forced them into a grinding war of attrition that favored the side with the larger population reserves. The Xiongnu were unprepared for such carnage in their own lands; within the first decade of the conflict the Han’s sudden attacks forced the Xiongnu to retreat from their homeland in the Ordos to the steppes of northern Mongolia. Then came a sustained—and successful—effort to apply the same sort of pressure on the Xiongnu’s allies and vassals in Turkestan and Fergana. By sacking oasis towns and massacring tribes to the east, the Han were able to terrorize the peoples of Turkestan into switching their allegiance to China or declare their independence from the Xiongnu. The Xiongnu were left isolated north of the Orkhorn. Under constant military pressure and cut off from the goods they had always extorted from agrarian peoples in China and Turkestan, the Xiongnu political elite began to fracture. A series of succession crises and weak leaders ensued; by 58 BC the Xiongnu’s domain had fallen into open civil war. It was one of the aspiring claimants to the title of Chanyu that this conflict produced who traveled to Chang’an, accepted the Han’s suzerainty, and ended eighty years of war between the Han and the Xiongnu . How did the Chinese transform an enemy whose realm stretched thousands of miles across Inner Asia into a mere tributary vassal? They did it through flame and blood and terror. Any narrative of Han-Xiongnu relations that passes over these eighty years of grueling warfare is a distorted depiction of the times. Stage One: start by conceding all that must be conceded to the superior power including tribute, in order to avoid damage and obtain whatever forbearance is offered. But this in itself entangles the ruling class of the still-superior power in webs of material dependence that reduce its independent vitality and strength. Stage Two: offer equality in a privileged bipolarity that excludes all lesser powers, or “G-2” in current parlance. That neutralizes the still powerful Other party, and isolates the manipulated soon-to-be former equal from all its potential allies, preventing from balancing China with a coalition. Despite all of this, Luttwak's contention that the Han-Xiongnu war left an imprint on the Chinese psyche that endures to the modern day is not lunacy. The legacy of this war looms large in the historical memory of the Chinese people; its influence can be discerned today if you are looking closely for it. "Emperor Wu['s military expansion] framed the concept of empire in such a way that [for the first time] it became an ideal of political culture in the Chinese mind and gradually fermented as a part of the Chinese conscious. Both the extraordinary kingship of Wu and the astonishing magnitude of the empire he built became the standard measure for dynastic greatness and the ideal model of empire building in China." Anyone who has had the opportunity to ask Chinese friends or acquaintances about the PRC's troubled relationship with the Uighur minority in the far reaches of Xinjiang can attest that the connection between national glory and dominance of the "Western regions" implicit in Wudi's policies is still very much a part of the Chinese view of the world. The war also created an important precedent for future Sino-nomad confrontations and the pattern set by Han-Xiongu relations can be seen in later times. The early Tang campaigns against the Turks and the Qing Dynasty’s successful conquest of Mongolia and Xinjiang were very similar to the operations of Wei Qing, Huo Qubing, and the other generals who fought in the first few decades of the Han-Xiongnu wars . The truth is, however, that there was no single “barbarian handling” strategy applied consistently throughout Chinese history. Some dynasties preferred to trade with and appease steppe leaders; others attempted to “fight barbarians with barbarians” and play different tribal groups off of each other to ensure that none became strong enough to threaten the empire. Yet others tried to block the nomads out of China entirely (the Ming Dynasty’s Great Wall being the most famous example). . The Chinese strategic tradition is not a uniform set of concepts and doctrines, and Chinese strategic theory is marked more by its intellectual diversity than intellectual continuity. Chinese statesmen turning to their country’s heritage for wisdom have many different strands to pull from. Thus the premise of Luttwak’s essay is a tad nonsensical. If there is any reason to excuse him for this nonsense, it is that there are very few books or resources he--or anyone else--can call on to obtain the background knowledge these kind of projects require. In English there is no history of the Han dynasty’s foreign policy. There is no military history of Han-Xiongnu war; nor is there a narrative political history of the period as a whole . One of the lessons I take away from all of this is that it is time for scholars with expertise on ancient China to return to political and military history. The scattered work of a few academics withstanding, for the last two generations the historiography of Warring States and Han times has been dominated by the study of philosophy, social and cultural history, archaeology, and literary and linguistic analysis. These studies are important. The great majority have been useful contributions to human knowledge; I have benefited immensely from reading many of them. But essays like Luttwak's make it clear that Western historians need to devote more time and effort to China's political and military history. China's rise in the 21st century has created popular interest in the wars and conflicts of its past. Unfortunately, those who want to study the Chinese strategic tradition or its military heritage have very few options to turn to. The books demanded simply do not exist. If actual experts do not write them then folks like Mr. Luttwak will. Unfortunately, the faux knowledge America’s foreign policy wonks will take away from flawed sources like this might have a real impact on the way these experts shape U.S.-China relations today. They deserve better history than what Luttwak offers here. SJ 108 (Records of the Grand Historian: Han Dynasty, vol II, trans Burton Watson, p. 112). SJ 110, 111 (Records, vol II, p. 153, 175-176). A point well articulated by Li Feng in Early China: a Social and Cultural History (New York: Cambridge University Press, 2013), who calls the campaigns "unprecedented in world history" (p. 275). Between the start of the war in 133 BC and Han Wudi's death in 90 BC, there were 20 large scale expeditions into Mongolia alone. Chang Chun-shu, The Rise of the Chinese Empire, vol I: Nation, State, and Imperialism in Early China, ca 1600 BC-A.D. 8 (Ann Arbor: University of Michigan Press, 2007), p. 164. For a comprehensive summary, see ibid., 239-236; for a polemical critique by a contemporary, see SJ 30, (Records, vol II, pp. 61-88). Sunzi Bingfa (The Art of War),ch. III, trans. Ralph Sawyer, in The Seven Military Classics of Ancient China (Boulder, CO: Westview Press, 1993), p. 161. I should note that I put the end of the war at Huhuanye's formal surrender in 53 BC, not the battle of Ikh Bayan (89 BC), as some folks (like Wikipedia!) claim. The best account of the war's end is Sophia-Karin Psarras, "Han and Xiongnu: A Reexamination of Cultural and Political Relations (II)," Monumeta Serica, vol 52 (2004), pp. 37-49. See also Thomas Barfield, The Perilous Frontier: Nomadic Empires and China, 221 BC-1757 AD (Cambridge, MA: Blackwell Publishers, 1989), pp. 60-67; Yü Ying-shih "The Hsiung-nu," The Cambridge History of Early Inner Asia (Cambridge: Cambridge University Press, 1994), 135-141. Edward Luttwak,"The Cycles--or Stages--of Chinese History," Strategika, Issue 11 (14 February 2014), p. 9. Peter Purdue, China Marches West: The Qing Conquest of Central Eurasia (Cambridge, MA: Belknap Press, 2006), 174-301. For surveys that capture the diversity of this experience, see Barfield, The Perilous Frontier; Arthur Waldron, The Great Wall of China: From History to Myth (Cambridge: Cambridge University Press, 1990); Sechen Jachid and V. J. Symons,, War and Peace along the Great Wall (Indianapolis: Indiana University Press, 1989);Morris Rassabi, ed.,China Among Equals: The Middle Kingdom and Its Neighbors, 10th-14th Centuries (Berkley: University of California Press, 1983). Let me explain this sentence lest readers question how I can make such a claim in an essay with 29 different foot notes. The Cambridge History of China, Ch'in and Han is the standard reference for the period and includes essays on each on each of these topics, but is devoted to none of them (it also costs $130+). Similar points can be made for The Cambridge History of Inner Asia, Warfare in Inner Asian History, Military Culture in Imperial China, and other collected-essay volumes of this type. Thomas Barfield's Perilous Frontiers and Nicolas di Cosmo's Ancient China and its Enemies are both excellent works, but their focus is on the Xiongnu, not the Han. Michael Lowe's Crisis and Conflict in Han China is a rare political history for the period, but it begins after the reign of Han Wudi, skipping the first century of the former Han dynasty. Mark Edward Lewis' Early Chinese Empires: Qin and Han is a survey of the entire period I would recommend to anyone, but it is organized topically and does not provide a narrative account of the dynasty's political or military developments. Similar limitations face books like Li Feng's Early China or Valerie Hansen's Open Empire whose large scope forces the authors to restrict themselves to topical analysis of the period. Yu Ying-Shih's Trade and Expansion in Han China has many interesting things to say about Han foreign relations and the Han-Xiongnu war, but only if these things impacted Han-nomadic economic exchange, which is the subject of the study. The best candidate of all is Chang Chun-shu's two volume The Rise of Chinese Empire, which has many pages of analysis on both the course of the war and the decision making process of the Han court. However, Chang's book is not a work of diplomatic, military, or political history, but a history of Han institutions. His focus is on how the Han adapted their government structures to meet the needs of Han Wudi's campaigns. Without digging into academic journals, this is about it. There are no biographies of Han Gaozu, Han Wudi, or other notable emperors of the Han, no narrative accounts of the dynasty's first century, and no military history of Han Wudi's campaigns or the Han-Xiongnu war published in English. This is true despite the fact that we are living in what historian Kenneth Swope calls "the golden age of Chinese military history in the West." Kenneth Swope, "Review: Military Culture in Imperial China," De re Militari (April 2009). As note 12 should make clear, this 'golden age' has left many subjects untouched. Outstanding post. More stuff like this needs to come out. The content that American media is churning out about China is laughably bad. Almost as bad as Chinese content about the West. "It is really a national security issue." I'll have to give your thought experiment some thought before I reply. Great post and quite solid analysis. I feel quite guilty that much of East Asian history is quite foreign to me. I openly enjoy your posts and the FB tags you include me in for them. Thanks for such a brilliant blog post. It's honestly kind of a miracle how you've been able to pull all the threads together on such a little-known subject in the West; I'm usually left to search up the index of Western histories of China to find barely a paragraph or less on the conflict of this time. Do you have any Chinese-language books on the Han-Xiongnu War (or any periods of Chinese military history really) that you'd recommend? I'd love to go deeper into this. A very well researched and informative article. Glad to have come across it. Excellent analysis, i especially liked how you used the secondary source material (the Grand Historian). But i asked myself, how to deal with the numbers mentioned in the sources especially relating to the strength of military forces. I have some very minor experience with early byzantine and high medieval battle descriptions. What I learned is that they are in 9 out of 10 cases totally unreliable (not in as much as they lie on purpose but more like they dont know better - although the authors i studied definitely wanted to paint a certain picture). I am curious about the numbers the study mentioned that you quoted in your piece. What are its sources? You did make very clear that the era of Han is understudied, but I have a supplementary explanation for why Luttwak did what he did. I have seen this kind of presentism times and times again in my own field of research, early modern Europe. Luttwak projected our contemporary political situation or rather one influential interpretation of it onto the past. Of course as historians we can never escape the convictions of our own time (in German we call it "Standortgebundenheit", situatedness?, literally restriction of place), but there is a difference between our point of view being constraint by the present or using the present, without scholarly/scientific reflections, as a template to make sense of the past (i.e. concepts, interests etc.). Please excuse my many errors, my English writing has become very rusty.